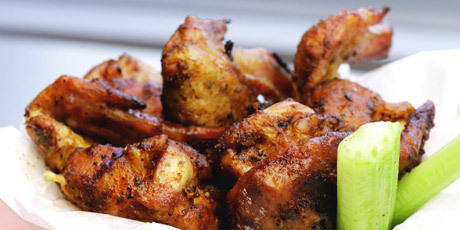 Get pub-style smoked wings at home with this delicious recipe by Cindy Wheatley of Boneheads BBQ. You might also like these Finger-Lickin' Chicken Wing Recipes. 1. Place all ingredients in a bowl and whisk to combine. 1. Preheat smoker (or grill if using the offset method) to 225 degrees Fahrenheit. 2. Rinse chicken wings and pat dry. 3. Place the wings in a foil pan or on a cookie sheet and lightly coat chicken wings with vegetable oil. (This helps the rub stick and keep the wings moist). 5. Place wings, evenly spaced, directly on the rack in the smoker for approximately 1 hour or until the internal temperature reaches 165 degrees Fahrenheit. 6. Check the wings and turn them halfway through and adjust positions if necessary to account for any “hot spots” within the smoker so the wings will cook evenly. 8. Note: Smoking times can vary greatly depending on wing size, outdoor weather conditions, smoker temperature, etc., so the above times are just guidelines. If you are unsure, having a digital probe meat thermometer handy will help determine when your wings have reached a safe temperature and are done.